We carry a wide range of spectacle frames of all shapes and colours, including designer brands. All of our frames are hand picked for their design, style and the quality of materials. All our lenses are supplied by a local laboratory using the most up to date lens types and materials including the new generation of higher index materials that are thinner and lighter typically up to 40% less then standard lenses. We encourage our patients, especially those currently using varifocal lenses, to consider the Freeform lens options. Freeform lenses embrace the newest lens technology available giving clearer vision in all situations. It is important with high prescriptions to choose the best possible lens designed to achieve optimum visual performance and appearance. We also offer Trivex (PNX) lenses which are virtually unbreakable these are available in most lens types as well as the new freeform lenses for a greater field of vision. With all of the above we also offer and recommend a range of coatings which will protect and enhance your spectacle wearing experience. 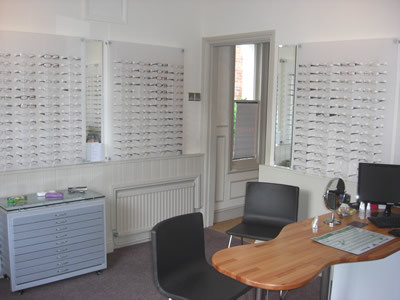 We can also offer a wide range of tints to compliment our lenses. This will give you the opportunity to relax, safe in the knowledge that your frame and lens choice will be of the highest quality available.